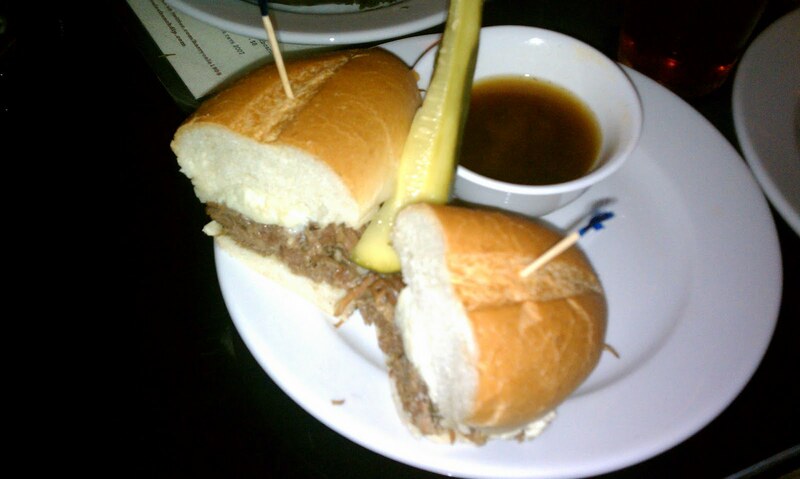 Welcome back for part two of my DANGERously insightful look at French Dip Sandwiches. 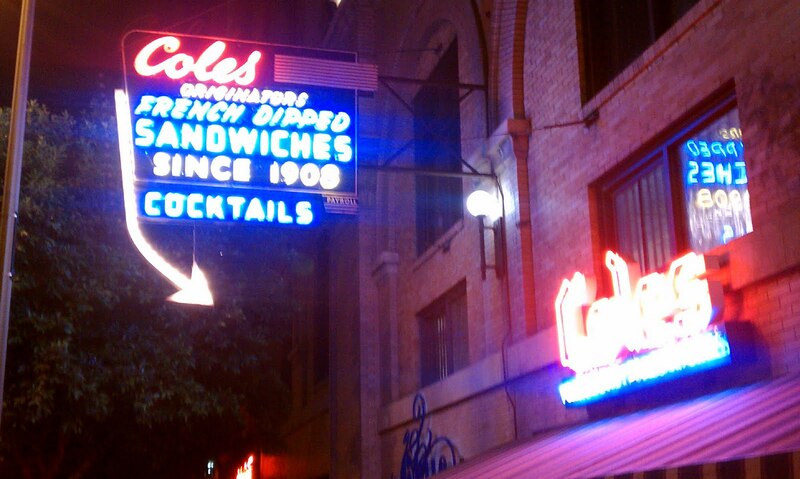 In last week’s post, I tackled Philippe The Original’s in downtown Los Angeles, and so this week I traveled a few streets west and found myself on Cole’s French Dip Sandwiches front step. 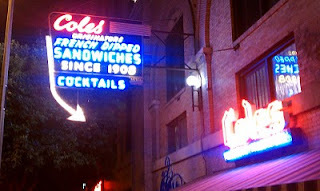 I have tried Cole’s before, but never in comparison to Philippe’s, so I cleansed my palate, and ate’s Cole’s French Dip as if I never had before. Despite what I’ve been told by so many people in Los Angeles, I have to say that Cole’s is my preference, and for a number of reasons. So, please dear Readers! Hear me out before cursing my excellent taste! 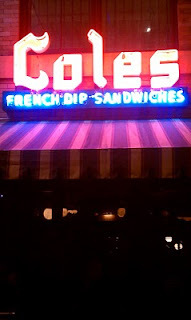 The chopped lamb was exceptional at Cole’s. It’s chopped much thinner than at Philippe’s, is thoroughly cooked without being burnt (unlike an occasional piece at Philippe’s), and was intensely flavorful and tender. 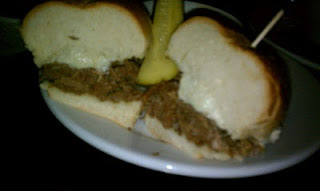 The bleu cheese was much softer, and more like a spread on this sandwich, compared to the solic brick on Philippe’s. While both were delicious, dry, and pungent as aged cheeses are known to be, I have to say Cole’s was much better as it became a part of the sandwich, instead of being a separate component. 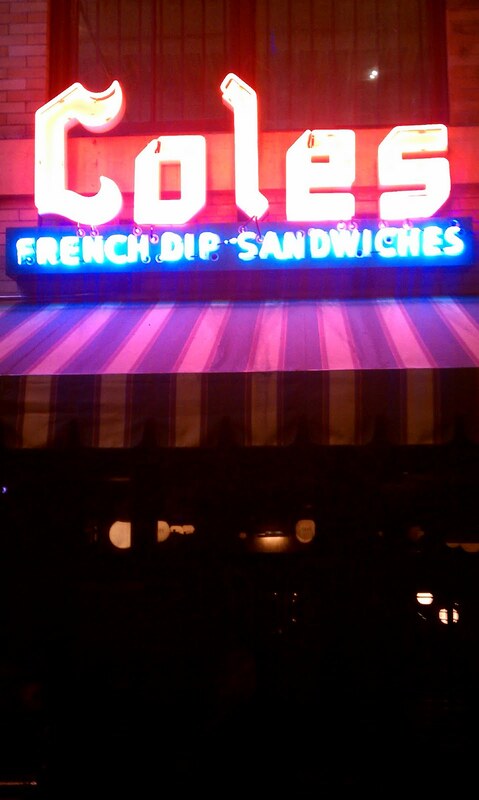 Oh, did I mention that you are allowed to dip your own sandwich at Cole’s? You are given a small cup filled with savory, slightly salty, meat sauce for your sandwich. An excellent complement to an already amazing sandwich. The bread at Cole’s was the only part of this sandwich that I was slightly disappointed with. Philippe’s was soft on the inside, golden and flaky on the outside, and would be great for dipping as it would soften the bread up perfectly. The bread at Cole’s was a bit tougher and thicker, so it was able to hold more au jus that I would normally care for. Easily remedied by dipping less. I also want to make a quick note about the sides at Cole’s. The atomic pickles are spicy, crunchy, and overall delicious. Order a side of them, but also ask for an extra glass of water. The bacon potato salad is probably one of the best potato salads I’ve ever had in a restaurant. Just the right amount of mayonnaise: not too moist, not too dry; full of flavor; and covered in delicious bacon. And don’t forget their horseradish mustard to put on each bite of your sandwich after dipping in au jus. Just remember though, for most people, a dab of this mustard is more than most people can handle. So use it sparingly if you’re sensitive to hotness. It’s just that when laid side by side with its famous competitor, Cole’s comes out in front, by a few roll lengths. All these meats I don’t eat…You should def do a vegan/vegetarian sandwich soon! By the way the Hoagie Steak Out has opened, it’s at Highland and Leland Ave. (one block past Sunset).